A one stop, comprehensive textbook, covering the three essential components of air pollution science. The Third Edition has been updated with the latest developments, especially the inclusion of new information on the role of air pollutants in climate change. The authors give greater coverage to the developing economies around the world where air pollution problems are on the rise. The Third Edition continues to cover a wide range of air quality issues, retaining a quantitative perspective. Topics covered include - gaseous and particulate air pollutants, measurement techniques, meteorology and dispersion modelling, mobile sources, indoor air, effects on plants, materials, humans and animals. Moving away from classical toxic air pollutants, there is a chapter on climate change and another on the depletion of stratospheric ozone. A special feature of this new edition is the inclusion of a fresh chapter on air pollution mitigation by vegetation, mainly its role in maintaining a sustainable urban environment. 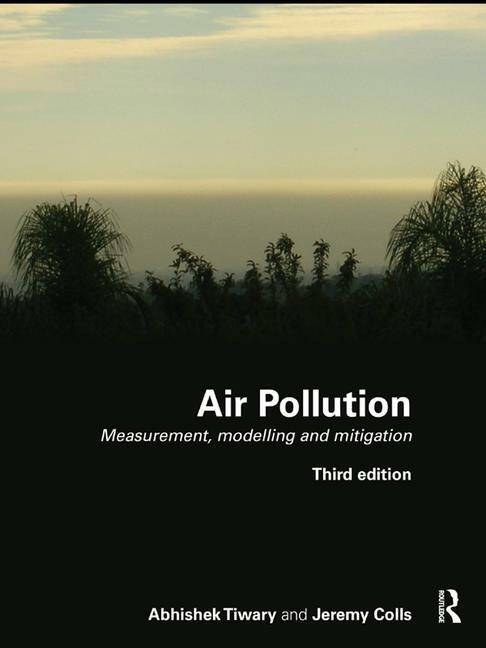 Recommended for upper-level undergraduate and postgraduate courses specialising in air pollution, both for environmental scientists and engineers. The new material included in the Third Edition extends its use by practitioners in consultancies or local authorities. Abhishek Tiwary is a Chartered Scientist and a Chartered Environmentalist involved in issues related to urban air pollution management and sustainable development. He is based at the University of Newcastle, UK. Jeremy Colls is Professor Emeritus in Atmospheric Environment at the University of Nottingham, UK. He authored the previous two editions of Air Pollution. "A good starting book for those studying the environment of the atmosphere." "The writing is accessible and generally clear, and most of the selected topics and examples are excellent... Summing up: Recommended."